My 7 foot x 7 foot little garden house with its cement floor and peaked roof is not a shed. Ted and a talented builder friend, Jeff, lovingly made it for me. Ted saved a 2' solid wood door, that I painted yellow and salvaged some old windows. With some new materials, but mostly old materials they made my little garden house. 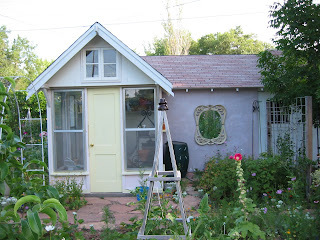 I use this little garden house to work with plants, harden off plants in the spring and once in awhile in the winter I go out into the little garden house and jump on a rebounder (an expensive little trampoline). The rebounder is low impact exercise and said to improve your immune system. Once in awhile it is good to jump around and look at the garden. This is the back view of the little house and end of the garage that lines the north side of my garden. The wall was so bare I took an old window and in the inside of the window painted curtains and geraniums in pots. A couple of years ago a hail storm broke one of the panes. The 3 little bird houses attracted wasp nest. So last year they went!" The little house is built at the end and inside wall of the garage. My pathways are made from the local pink limestone. So I painted the walls pinkish. Notice the mirrow we salvaged. The wooden tower in the front of the picture is one of my tomatoe towers. The little garden house is in the distance. There is a bit of a hidden garden behind and to the right of the little house. Oh, Gloria, it's perfect! The mirror is such a nice touch. I love mirrors used outdoors. All my structures are either rustic or practical, nothing really Pretty. Happy New Year. It doesn't have to be flashy or large - just enough room to call yours and the gardens own! Your embellishments all add to its quaintness and charm. I love your little garden house. It has so much character and my favorite part is your painted window. Each time you give us a new view of your garden, I am struck at how much I love it. Definitely my style of garden. Lovely Gloria!! I love your garden house and all the gardens around it. It is good to jump a bit ... to build strong bones too so I have read. 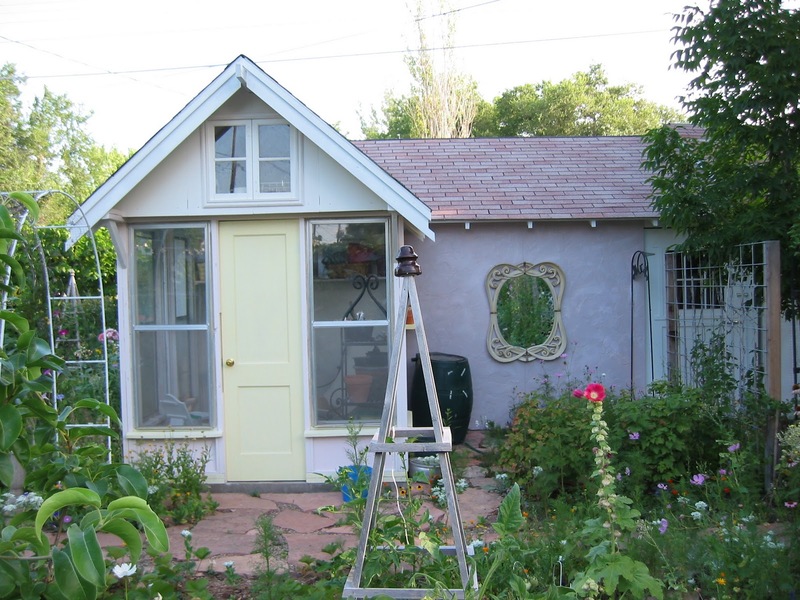 Sweet story of how your garden house came to be too. Wow, what a sweet little garden/trampoline house. I need to find a clever building friend to make me one! Gloria, I absolutely love your little pink and yellow house. It is perfect and look beautiful among the gardens. If only I could get one like that. Thank you for sharing your lovely little garden home. Hi Christine from: http://lastfrontiergarden.blogspot.com/ , I am still laughing about your comment on my last post on "Making a Yard into a Secret Garden" - I wrote about how my husband pulled out a napkin, like he has so many times before and draws a "plan" - You commented "I wish I had a hubby who was handy with a napkin" -And now this comment. I think we could have a comedy team. I do the straight line and you deliver the funny punch line. Thanks for the LOL! Also I did that flower thingy test and I came out a daffodil, like you! It's so cute! It looks just perfect in your garden! Adorable! It reminds me of my childhood playhouse. What a charming garden you have. My first visit and I look forward to seeing more. Also my first time visiting, but I'll be back. I really, really like your garden house. I'd be out there with a cup of tea and a good book (or my laptop) when not gardening. Happy New Year to you! Hi Gloria~~ You are one lucky gal, having such a skilled hubby and friend. Fabulous idea, really blurring the boundary between inside and out. Your gardens look magical and I look forward to seeing more and maybe a peak inside your garden house too? Pretty please? Sorry the wasps had to go. Actually, I waited to remove the dryed out nests after the wasp had left. I'm sure they are around here somewhere. I always have lots and I don't like to kill anything. The wasp used to nest around my front porch and bother me. (Stung me once) when I would sit on the porch. This year I harvested some garlic and hung it to dry on the front porch. I never saw a wasp come to the porch. I wonder if it was the garlic? Anyway, that is what I shall do from now on. Oh, how cute and cozy! I love little cottages. And, yours is just darling! Gloria, I just love it!!!! You little garden is so wonderful. Thank you for sharing it with me! I will check out the recipes as well. I should do something like this with the garden shed that we inherited with the house. Right now it looks halfway to cottagey. I would love a cement floor. I have hesitated to do that in the past because our shed housed a groundhog every summer that was very effective in keeping cats away and eating weeds. But, he's moved on now, so maybe it is time for cement!